"The police job had some pretty major things," said his former wife, Raquel Martinez, a professional bullfighter. "Those types of things were very hard for him, and for anybody who's human." Mr. Robinson was born in Brady, Texas, on Aug. 16, 1941. His mother died seven days later. Mr. Robinson was raised by his grandparents in Abilene, Texas. As a young man, he joined the Marine Corps, which brought him to San Diego in the early 1960s. He went on to earn a communications degree from California State University Fullerton while working for a bank and newspapers in Orange County. His son, Scott, 30, said his dad sent out 141 applications seeking work after graduation and landed back in San Diego, where he was hired as a staffer on a city-funded newsletter. An aide to then-Mayor Pete Wilson recommended Mr. Robinson for a job as public information officer for the Police Department. Mr. Robinson held the job until retiring in January 2004. 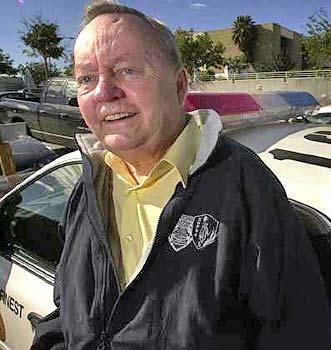 He was in the job for six police chiefs and three of San Diego's greatest tragedies. He also married Martinez, whom he met in 1970 at a bullfighter party attended by actor Kirk Douglas. The relationship helped Mr. Robinson become fluent in Spanish. Martinez said he wanted to know what her family was saying about him. "My mother loved him. She cooked for him. They loved him and took him in," she said. "And we're Mexican. He's American. He loved having a Mexican family." Scott said his dad's diverse background helped him win the police job. "They knew he was racially and culturally sensitive. He made that job," Scott said. "But the only reason he did that job – nothing more, nothing less – was that he enjoyed helping people." His resilience came in handy when 144 people died after a private plane and a PSA jetliner collided over North Park in 1978. Airplane wreckage and body parts were strewn for several blocks. Mr. Robinson led the media into the site. He described the scenery as "the closest thing to Armageddon that this city has ever seen" in a 2004 interview with The San Diego Union-Tribune. Six years after the crash, in 1984, a gunman walked into a McDonald's restaurant in San Ysidro and started shooting, killing 21 people and wounding 14 others before a police marksman shot him dead. Mr. Robinson went to that scene, too. Years later, he told reporters that he was shaken by the sight of a young boy whose body lay next to his bicycle. At the time, the boy was Scott's age. Then there was the October 2003 firestorm that swept through the county. Yet for all the tragedy that characterized his job, Mr. Robinson was quick to return reporters' telephone calls or plug a good deed done by passers-by and police officers, said Dave Cohen. "He loved it. It was his life," Cohen said. Cohen, a television reporter who left Channel 8 to join the Police Department's public information office in 1988, said Mr. Robinson was unusual because he was a civilian working in a position dominated by sworn officers. The difference showed, Cohen said, because police officers working as public information caretakers tend to favor the department's desires over the public's and use the job to climb the ranks. As a civilian, Mr. Robinson was the opposite. An advocate of disclosure, Mr. Robinson said in a 2004 interview that his approach was simple: "When the public is informed, they are confident. When they are not informed, they are vulnerable." In addition to his son, Scott, of Oak Park, Mr. Robinson is survived by his sister, Barbara Ella Hollingsworth, of Dallas, Texas. A public visitation is planned from 4 to 9 p.m. Tuesday at the Glen Abbey Memorial Park & Mortuary, 3838 Bonita Road, Bonita. A public funeral service will be held there at noon Wednesday. Bill Robinson, who was the link between San Diego's Police Department, media outlets and residents through some of the city's most traumatic events, died Wednesday night in his Oak Park home after a four-year battle with cancer. He was 64. Mr. Robinson spent 30 years with the department as its public information officer, striving to meet the public's desire for information without giving up too much police control over the details. It was a delicate balancing act. Those who knew him best said Mr. Robinson, who favored public disclosure, made it an art. They also said he loved the high-stress, extended-hours job.